Another round of the FA Trophy today, which will wrap up home games played during November. So time to pick your Player of the Month. There has been some great performances by the players this month, so who has impressed the most. Will it be one of the players who have already won it this season or will we have a new winner. 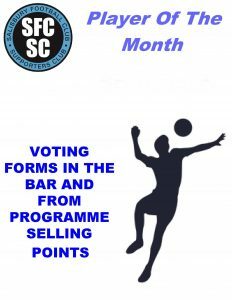 You can vote today, voting slips will be in bar and at the programme sellers locations.